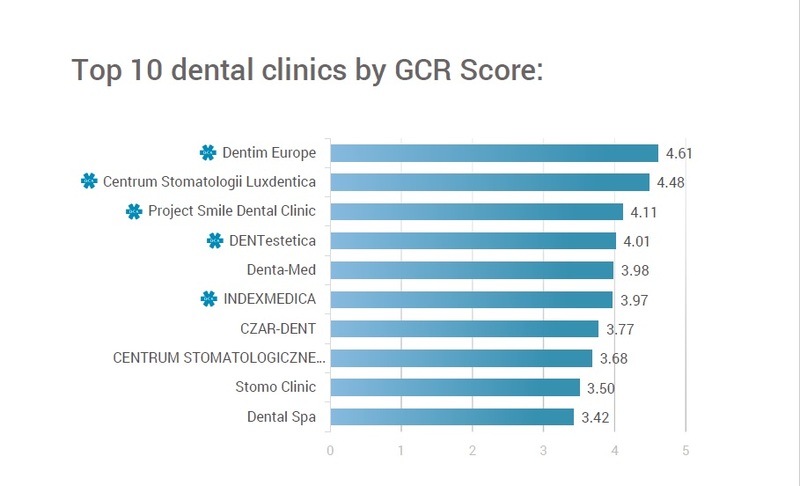 According to the GCR’s latest analysis of TOP 10 Dental Clinics 2017 in Poland, Dentim Europe ranks as the leading clinic, when it comes to overall international clinic reputation. A total of 1883 dental clinics were included in the study. The average GCR dental clinic quality score was 2.42. This fact demonstrates the huge range of rising healthcare standards available in the country. The GCR – Global Clinic Rating is the leading provider of healthcare clinic ratings worldwide. It aggregated and analyzed dental clinics throughout the Poland during 2017 including dental clinics in Warsaw, Katowice, Kraków, Gdańsk and others. Dentim Europe in Katowice ranked #1 with a GCR Score of 4.61. It ranks #10 from 125,842 dental clinics monitored worldwide, followed by the Centrum Stomatologii Luxdentica (4.48) and the Project Smile Dental Clinic (4.11). It is important to mention that all of this three clinics came out almost top (4.1-4.6) for their Feedback Score. Medical tourism in Poland started to be very popular in 2003 and the number of international patients is still growing . The most visited departments are cosmetic surgery and dentistry. Most of the private clinics are located in bigger cities like Warsaw, Kraków, Wrocław, Gdańsk, Katowice, etc. These clinics have mostly international departments and their linguistic abilities are very good (English, German and Russian). Dental services in Poland are very high value for their prices. Medical tourists are attracted by Polish clinics not only by low-priced treatments, but also by the high-quality services, modern facilities and positive patient’s feedback. The GCR clinic star symbol represents that the clinic has been officially verified as meeting or being above international medical clinic standards. It uses the data provided by the GCR to constantly improve the clinic for their patients. Seven clinics in Poland has achieved the GCR international accredited clinic status. Download the GCR’s full report POLAND: TOP 10 Dental Clinics 2017 to discover the names of the other dental clinics that made it to the Top 10 dental clinic list in Poland and to find some brief statistics of these clinics.